Welcome back to Japanese Cooking 101: The Fundamentals of Washoku. We are entering the most involved lesson in the whole series: how to deal with fish. As I explained previously, learning how to deal with fish is pretty fundamental to conquering traditional Japanese cooking. So, Lesson 5 is divided up into several parts. 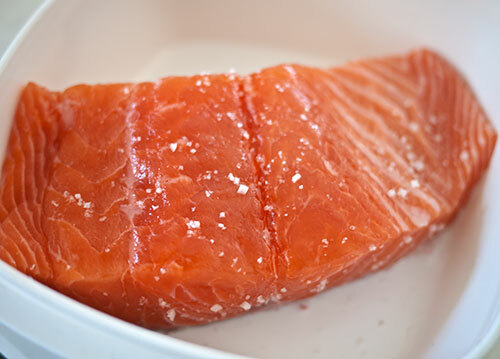 Before we dive into the deep end, let's start with something easy: cooking a piece of salmon. 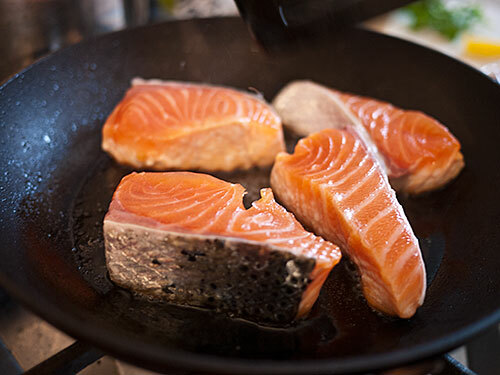 Salmon is one of the most easily obtainable fresh fish, since it's so popular, still available in abundance since part of the supply comed from fish farms (although the farmed variety has some catching up to do in terms of taste to the wild kind), and overall a pretty easy fish to deal with. It usually comes to us in cut form so we don't have to deal with de-boning or fileting it and things. Incidentally, I prefer to buy all my fish, salmon included, with the skin on. The skin of a salmon is delcious anyway, but the main reason for buying a fish with the skin on is that it holds the flesh of the fish together better. And with very low-fat fish the skin helps to prevents the flesh from drying out too much. While I've given you several formulas for teriyaki over the years on both JustHungry and JustBento, this is the one I use the most now because it's easy to memorise. The teriyaki sauce formula is a 2:2:2:1 ratio of soy sauce, sake, mirin and sugar. You can halve or omit the sugar if you like it less sweet. The sake and mirin are what give this that delicious 'teriyaki' flavor, so do try to use them if possible. Leave the fish like that for at least 30 minutes if you can, or in the refrigerator for up to a day. 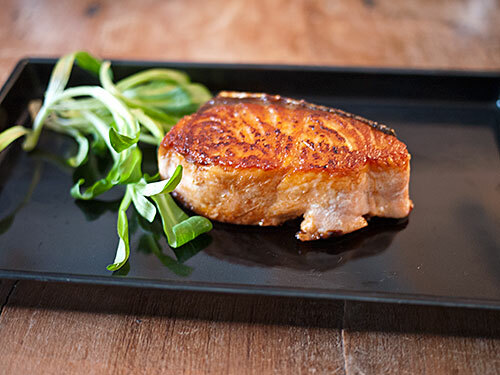 Cut your slab of salmon into individual serving size pieces about 2-3 cm (1 to 1 1/2 cm) wide. Optionally coat each piece in flour, cornstarch or potato flour - this will make the sauce a bit thicker. The rest goes very quickly. Teriyaki is cooked about 80% of the way before you add the sauce ingredients. 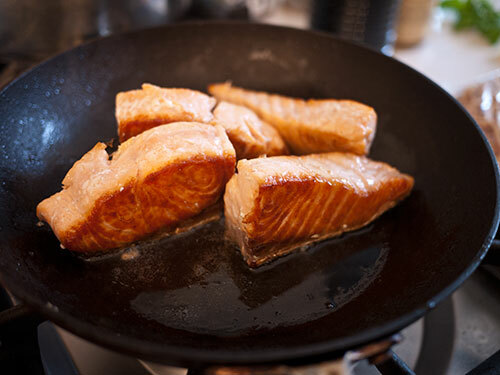 Heat up a frying pan with a little cooking oil, and put in the salmon in one layer. Cook each side over medium-high heat until browned. Make sure to brown and crisp up the skin side well. 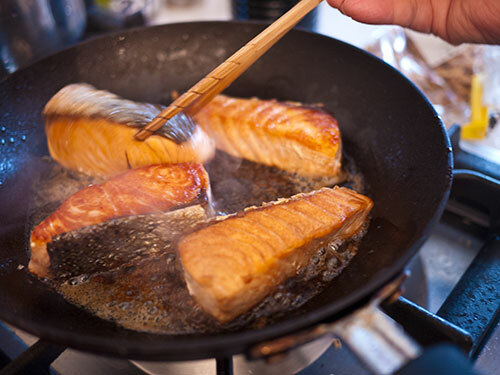 While you are cooking the salmon, combine the soy sauce, sake, mirin and sugar in a bowl. 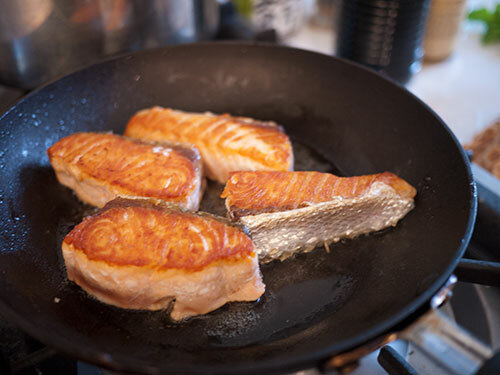 When the salmon is just about cooked, add all the sauce ingredients in one go into the pan. Careful - it will sizzle and spit a bit. Rapidly turn the fish pieces so that they are coated in the sauce. In the meantime the sauce will thicken up a bit as the moisture evaporates. When the salmon is a deep golden brown, it's done. The basic rule for how to present a piece of fish is, to put the skin side away from the diner. There should always be a bit of garnish too, to provide a contrast in color as well as a contrast in taste. This can be anything that's nice and green - here I've just used a bit of lamb's lettuce (mache), but traditionally you might use a couple of shiso leaves, or panfried shishito peppers, or even a couple of green beans or snap peas. You can use this exact same formula for any kind of oily, firm fish such as swordfish or mahi-mahi. It is perfect for buri or amberjack/yellowtail. It doesn't work as well with white fish, but you can give it a try providing the fish is firm. 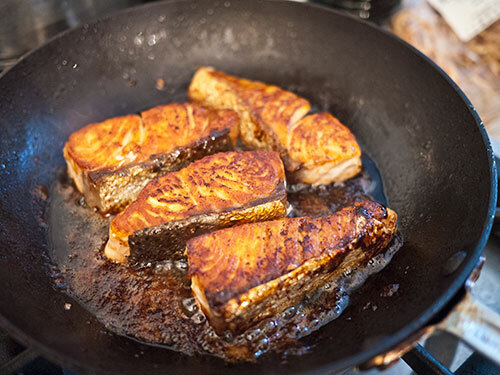 If you are making a larger quantity, use a ratio of 2 tablespoons each of soy sauce, sake, and mirin plus 1 tablespoon of sugar per 100-120g (3 to 4 oz) of fish. You can also use a similar formula for chicken, including the pre-salting. Use the thigh meat, skin on or off; if skin on, pierce the skin a few times with a fork before cooking, and start cooking with the skin side down. Turn over when the skin is nice and crisp. Note that I do not marinate the fish in the sauce beforehand. This is because I think the fish tastes better if it has been pre-salted instead, which enhances the umami that is already in the fish. Not pre-marinading also means you can get a nice crispy skin. So, that was easy wasn't it? Next time as we continue the Fish Lesson, we'll dive into something a bit more challenging. Submitted by maki on 2013-04-16 22:05. I used to think making my own teriyaki sauce is too difficult, Few years ago I never used sake and mirin, it would've been a waste to buy them just for making teriyaki sauce, instead I bought myself a bottle of kikkoman teriyaki sauce (gasp!!). But now that I cook more japanese and korean food, mirin and sake is always available in the pantry and fridge, making it a cinch to make teriyaki sauce from scratch. Also, my sister makes salmon teriyaki for her kids all the time, but she uses organic honey as the sugar substitute. uhhh... am i seeing double? is step 5 a repeat of 4? that salmon dish looks awesome, btw. My mouth's watering and I ate dinner not too long ago! and it was salmon as well! Hi Maki, We have been using this method for several years now, thanks to your web site. Our enhancement is to finely chop fresh ginger and add it to the sauce. Thank you for waking me up on bentos again; I will also be teaching my neighbour, who needs to cook for only 1 person. Just yesterday I've discovered that my usual store added fresh salmon to their selection. That must be a sign!! So I guess I'm going to give your recipe a try and make it in the evening and take the leftovers in my bento. How would you actually cook this for kids? Sake and Mirin contain both alcohol. Is that an issue in Japan? Even with cooking alcohol does not completely evaporate (if you want to mention this ;) ). Is there a way to replace the alcohol? I addressed the sake/mirin question in depth here. This looks beautiful! Thank you for sharing. Thanks for doing all this. I've learned a lot so far. My salmon came out beautifully. The flavor was great. You were right about everyone having a different recipe for teriyaki sauce, in fact when you first announced that this week would be either salmon or chicken, I was hoping it was this. So far this simple ratio for teriyaki is the best I've tried so far. Even my picky roommate liked it. I just wish my closest grocery store had more than just farmed salmon. Next time I'll drive the 10 extra minutes to the bigger grocery store. So all in all, for having to make it in a communal kitchen with meager supplies, I think it all turned out really well. I almost always have a piece of shiosake or shiosake-to-be ready, thanks to your recipe from ages ago; next time I will have to try this teriyaki preparation for a change. Blanched green beans or haricot vert with a citrus vinaigrette is my favorite salmon side. Oh, and I agree on the necessity of the skin. When the salmon is cooked through, I like to peel the skin off, salt it well, then dry-fry it on high heat and make a "chip" out of it. This is definitely a cook's treat straight out of the pan, and crumbled, makes a waste-free furikake too. If you use this for Bento. How far in advance can you cook the Salmon? Could you cook it the night before and eat it for next lunch? I made the salmon tonight and holy cow, this was delicious. My 12 year old couldn't get enough of it. I think I prefer your teriyaki sauce better than many restaurants, its awesome. Thanks!! This looks really good! I'm curious, in the final picture you have plated the salmon dry, without the teriyaki sauce. Do you not serve the remaining sauce from the pan? Or did you withhold it and pour it on later? I made this for dinner this evening. Wonderful! And wonderfully simple! Thanks! I am looking forward to trying other recipes from your site. I wanted to let you know that I have mow made this twice - once with salmon and once with meat, and in both cases it was extremely tasty and in the case of the fish (which I made for my partner - he's a pescatarian) was very well-received! I served it with plain rice, miso soup with thinly sliced mushrooms and chives, and a small side dish of sliced cucumber and carrot shavings with ponzu dressing. In regard to the meat - because of what was good and cheap in the supermarket on the day I went shopping, I used slices of turkey breast fillet about an inch thick and cut them into strips of the appropriate size. And I have to say, it turned out really well - the sauce kept it nice and moist. Turkey is often a cheaper alternative to chicken in the UK, so it may be an interesting suggestion for anyone else wanting to keep their costs down.